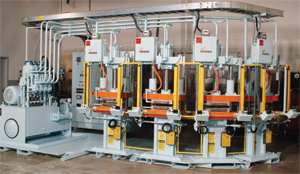 Phoenix Hydraulic Presses, Hilliard, OH, has custom engineered a heated-platen, two-column hydraulic press to improve the cycle times for bonding paper material to a metallic ring. Four separate cells were produced, each consisting of four 30-ton presses individually driven by a single power unit. Each of the presses feature 13 by 14-in. heated platens with insulation on the bottom and sides, capable of reaching working temperatures to 700 F.
The cells were designed to build pressure on one press while allowing movement of the next press platen, reducing cycle times. The presses are controlled by an Allen Bradley 505 programmable controller with an Allen Bradley Panel View 1000 operator interface to run machine functions. A 150-gal. floor-mounted hydraulic reservoir features spin-on filters. The cell can be designed in a variety of tonnages and engineered to meet custom specifications and applications, and also can be outfitted with a complete automation system.